Key to understanding the worldview that cosmometry is founded upon is the idea that the Universe is both fractal (the same pattern of wholeness is found at every scale) and holographic (the wholeness is present everywhere and within every entity), as well as synergetic (the whole is greater than and unpredictable from the sum of the parts). Although the science and study of fractals is very deep and rich with mathematical precision and aesthetic variety, in the basic context of cosmometry we are using the term in its most simple expression: the repetition of patterns at all scales from micro to macro. Fractal scaling is clearly present throughout the cosmos and has been extensively explored by pioneers such as Benoit Mandelbrot as a means to describe the repeating patterns of plant parts, coastal and mountain contours, river branching, lightning, clouds, wave patterns, etc. In cosmometry we are exploring the primary patterns, structures and flow forms that appear fractally, and how these primary attributes are seamlessly embedded from atomic to galactic scales. Fractal scaling is one of the keys to understanding the full cosmometry model, especially when we seek to wrap our minds around the fact that there is a seamless movement of energy and information throughout the entire cosmos that manifests "locally" while remaining connected "universally". In order to fully comprehend the essence of what fractal scaling means, though, we have to view the cosmos in its most pure and ideal energetic expressions, then extrapolate those expressions into the unique forms they take, be they apparently crystalline/atomic/vectorial/structural, or fluid/plasmic/vortexial/toroidal (ultimately it's always a "both/and" of these two states, but their dominant expression will typically look one way or the other). Two fractal scaling ratios are fundamental in cosmometry: Octave Doubling and Phi Expansion/Contraction. Octave Doubling is found in the primary structure of the Unified Field (isotropic vector matrix scaling, cosmic octave hierarchy), as well as in the cosmometry of music (both in terms of pitch and rhythm) and the 64-based (8 octave) nature of binary digital systems. Phi Scaling is ubiquitous in nature in both structural and flow forms, as is explored extensively in the Cosmometry 201: Cosmometry of Phi section. (See also the Analog & Digital Numeric Symmetry article for insights into how these two co-exist with seamless numeric symmetry). A deeper exploration of the Fractal aspect of the cosmos will be found in the Cosmometry 201 section in the future. For now, the main thing to remember is the simplicity of the concept... the same patterns repeat at all scales. As with the fractal aspect, the concept of the cosmos being Holographic as a primary attribute is also very simple: the whole is present everywhere. Again, the science of holography and the holographic principle of the universe is deep and rich with fact and aesthetic beauty. For our initial explorations, though, we are using the most basic ideas of how a holographic model informs us about the nature of the cosmos. 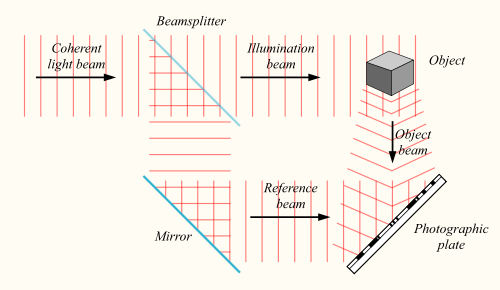 What is striking about a hologram as compared to a regular photograph, though, is that every point on the holographic plate captures light from every point on the object that reflects the laser light back onto the plate. Said the other way around, light from every point on the object is captured at every point on the holographic plate. This means that the entire image of the object is contained at every point on the holographic plate. In fact, when a holographic plate is broken into pieces, each fragment of the plate will still contain an image of the whole object (as opposed to a photograph which only contains parts of the image when cut into pieces, like a jigsaw puzzle). It is this principle of holography that is primary to cosmometry — that the entire "image" is contained at every point in the cosmos. This may seem strange at first, especially since it would seem if that were the case we'd only see the whole universe wherever we look. Well... there's a simple little thought experiment that suggests that ultimately, this is true, but it just depends on our frame of reference as to what we actually see of the whole (relativity). Quite simply, imagine looking at a most clear and brilliant night sky full of stars. No matter where you move to, no matter where you put your eye, there are photons of light from every one of those stars contained at every point. There aren't any "gaps" where only some stars are showing and others are not. There are literally photons that emanated from every star that's visible converging at every most minute point imaginable. The entire image of the celestial realm is contained at every point — the definition of a hologram in our context. It is also possible to reverse this thought experiment and imagine yourself in a room where all of the walls, floor and ceiling are mirrors (such as in the Temples of Humankind at Damanhur). Everywhere you look, you'll see a reflection of yourself. 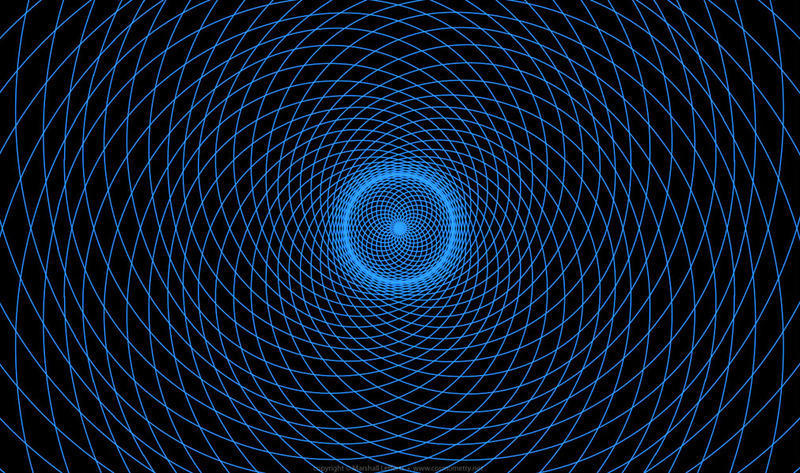 This means that your image in its entirety is present at every point surrounding you. Again, the whole is present everywhere, but in this case projected outward from yourself. Lastly, for this simple introduction to the holgraphic nature of the cosmos... and this may come across as being a bit trite... it's likely not possible to have such a thing as a hologram exist within a non-holographic universe. 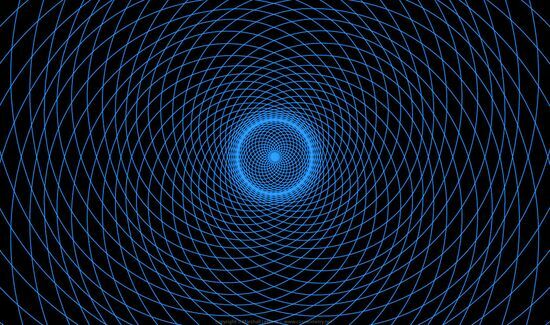 The simple fact that we have defined and proven the science of holographic interference patterns in light means that the universe must be holographic, otherwise we couldn't make something so fundamental happen that is outside the actual nature of the cosmos itself. The great 20th century physicist, David Bohm, developed a comprehensive model of a holographic universe which will be explored in depth in the Cosmometry 201 section of the site. We human beings are a synergetic phenomenon. Take all the "pieces" of our bodies and lay them out separately. Even when you imagine combining them all with the functions they perform and the relationships they have with each other, could you possibly predict they could write a symphony or transport themselves around the world at jet speed? What is important about synergy as a primary aspect of the cosmos is that, although we can't predict what it will be, we do know that when we combine "things" (such as the metals in the example above, or even the combined contributions of a group of individuals on behalf of a shared purpose), something greater will arise that we can only witness when it does, and not before. The beauty of this fact is that what we like to call the "mystery" remains alive and well, even as we attain greater and greater degrees of understanding and put that understanding into application. We can trust that when the right ingredients come together, like a phenomenally delicious meal, we will experience something beyond what we could have imagined when we started combining all the parts. This principle is essential at this time of evolutionary shift. Imagine the synergetic effect that will arise when we create whole, balanced and thriving systems within each of the 12 Sectors, and those twelve come into a higher order wholeness that is greater than and unpredictable from the sum of its parts. One thing is for sure, we know it will be phenomenal!